My second day on the show floor allowed me to follow up a bit more on a few technologies that I found intriguing the day before. The move to IP video and higher resolutions in post production leads to increasing needs for higher speed networking, which is more complicated than the old 10/100/1000BaseT connections. HDR involves a number of challenges, and a better understanding of color science and dynamic range, and as always, there are tons of new products in every category to try to familiarize myself with, so I can continue to be knowledgeable on the options that are out there for different scale workflows and use cases. AJA released a few new products and updates at the show. Their KUMO SDI switchers now have options supporting 12G SDI, but their Kona cards still do not yet. The new Kona1 is a single channel of 3G SDI in and out, presumably to replace the aging Kona LHe as analog is being phased out in many places. There is also a new Kona HDMI, which just has 4 dedicated HDMI inputs, for streaming and switching. This will probably be a hit with people capturing and streaming competitive video gaming. 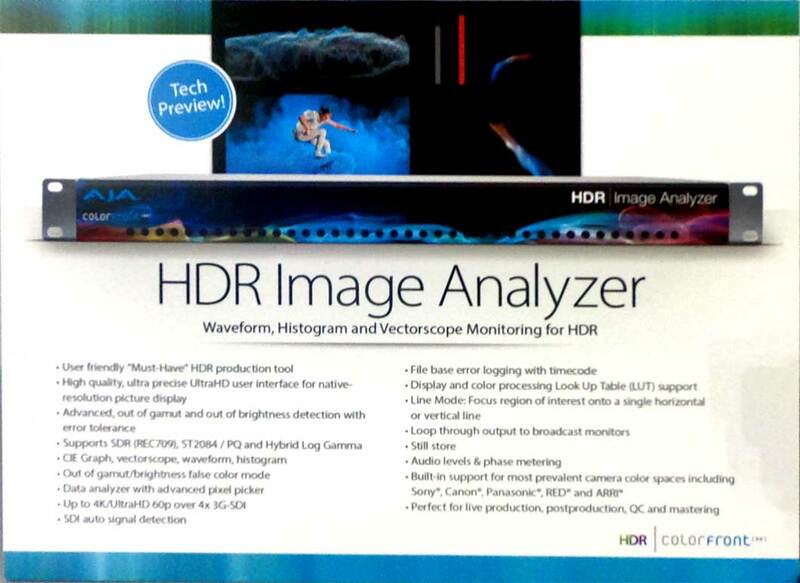 Besides a bunch of firmware updates to existing products, they are showing off the next step in their partnership with ColorFront in the form of a 1RU HDR image analyzer. Not a product I need personally, but I know it will have an important role to fill as larger broadcast organizations move into HDR production and workflows. Sharp had an entire booth dedicated to 8K video technologies and products. They were showing off 8Kp120 playback on what I assume is a prototype system and display. They also had 8K broadcast style cameras on display in operation, outputting Quad 12G SDI that eventually fed an 8K TV with Quad HDMI. They also had a large curved video wall, composed of 8 individual 2Kx5K panels. It obviously had large seams, but it had a more immersive feel that the LED based block walls I see elsewhere. One product that I was pleasantly surprised to discover is that NAS vendor QNAP has released a pair of 10GbE switches, with both SFP+ and RJ45 ports. I was quoted a price under $600, but I am not sure if that was for the 8 or 12 port version. Either way, that is a good deal for users looking to move into 10GbE, with 3-10 clients. (2 Clients can just direct connect) It also supports the new NBASE-T standard that connects at 2.5 or 5Gb instead of 10Gb, depending on the cables ands NICs involved in the link. It is of course compatible with 1Gb and 100Mb connections as well. On a related note, the release of 25GbE PCIe NICs allows direct connections between two systems to be much faster, for not much more cost than previous 10GbE options. This is significant for media production workflows, as uncompressed 4K requires slightly more bandwidth than 10GbE provides. I also learned all sorts of things about the relationship between 10GbE, and its quad channel variant 40GbE, which with the newest implementations is 25GbE, allowing 100GbE when four channels are combined. I didn’t previously know that 40GbE ports and 100GB ports on switches could be broken into four independent connections with just a splitter cable, which offers some very interesting infrastructure design options, especially as facilities move towards IP video workflows, and SDI over IP implementations and products.